71 holiday Apartment Complex with a pools. Studios and One and Two bedroom apartments. Conveniently located in residential area between Albufeira Centre and 'The Strip'. Discounts for Online Booking. 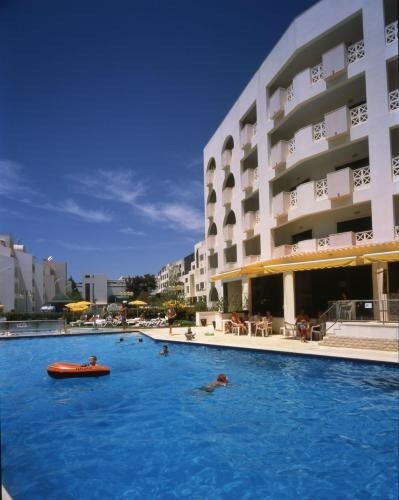 The Varandas de Albufeira Apartments is located in the east part of the town of Albufeira in the Algarve. There are 71 apartments divided into Studios, One Bedroom and Two Bedrooms. Each apartment has air-conditioning, an equipped kitchen or kitchenette and twin beds. there is satellite TV, safe, and direct telephone. Set back from the beach it is still within 30 minutes walking distance and approximately the same to the centre of Albufeira or to the nightlife area named 'The Strip' with its many bars and restaurants. Two outdoor pools set in landscaped garden, one for children, a restaurant and a snack-bar, a Games Room, public Internet access and a nearby parking area.